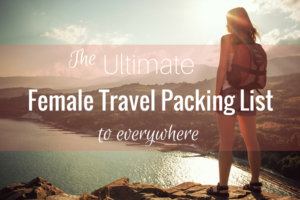 Click here to see a master list of all our female travel packing lists. Or, join our community at #HPLWorld to discuss your packing list with other female travelers. Mount Fuji in Japan is not a mountain for beginners but it is rewarding. Here’s the ultimate female packing list for climbing Mt. Fuji to help you prepare. Julie challenged herself to travel small with a 26L bag as her main luggage and learned a valuable packing lesson in the process. Prague is one of the most popular cities to visit in Europe for good reasons. To prepare for your trip, read the female packing list for Prague in summer. Caroline recently traveled to the Dominican Republic. She shares her female packing list for the Dominican Republic to help you prepare for your trip. From dealing with hot and rainy weather to toughing it out through power outages, J shares her Malawi packing list to help you enjoy this beautiful country. Anna found that Romania wasn’t as warm as she had hoped in early spring. Here’s her female travel packing list for Transylvania to help you plan your trip. If you travel for work and pleasure, check out this packing list for a workcation. These tips will help you look professional while working from the road. Are you planning a trip to Mexico’s beaches and Mayan ruins? Read Katherine’s female packing list for the Yucatan Peninsula to prepare for your trip. I traveled for over 3 weeks with the contents of a well-packed 12L handbag and a well-planned ultralight packing list. If you dream of minimalist travel, this post is for you. LA is a popular city to visit for its film and TV culture and history. Read Perri’s ultimate female packing list for Los Angeles in summer before you go. Do you have a disability? Karin loves to travel and she doesn’t let her mobility disability stop her. Check out her helpful wheelchair travel packing list. Check out this packing list for Central America before you leave for your trip. This is what Ali recommends for Belize, Guatemala, Honduras and El Salvador.